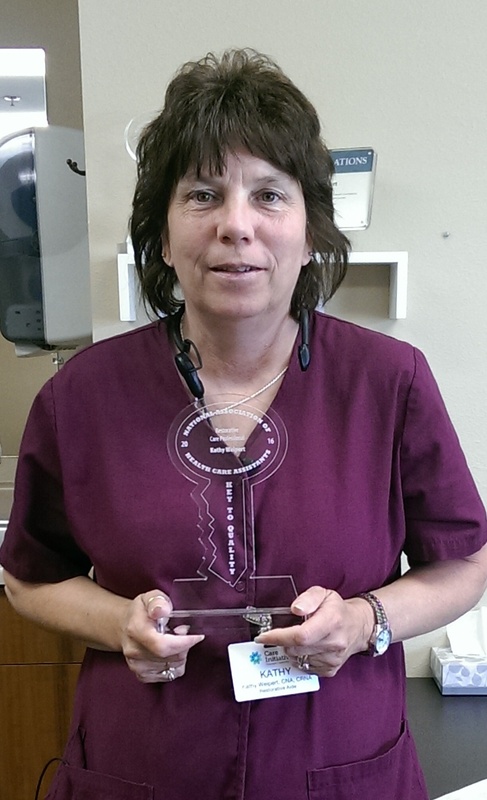 Kathy Weipert, Certified Nursing Assistant (CNA) at Dubuque Specialty Care was named the National Association of Health Care Assistants’ (NAHCA) Restorative Care Professional of the Year on June 2 at NAHCA’s national annual conference held in Des Moines. The CNA chosen for this award displays knowledge and competence in restorative care and possesses the skills to promote the highest level of functioning. The award winner also has been successful in the past having significant impact in restoring functioning levels to residents who have been able to live independently as a result of her care. Dubuque Specialty Care is an 98-bed skilled nursing facility offering rehabilitation services, skilled nursing care, long term care and hospice care. It is owned and operated by Care Initiatives, Iowa’s largest not-for-profit senior care provider. With headquarters in West Des Moines, Care Initiatives and Care Initiatives Hospice operate 55 skilled nursing, rehabilitation, Alzheimer’s/dementia, assisted living and hospice locations throughout Iowa. We are committed to providing compassionate care for Iowans through all of life’s health transitions. For more information about Care Initiatives, visit careinitiatives.org or call 563.556.0673.